Lots of exciting things are happening at the Institute. In fact there is more to report this month than space to describe it. 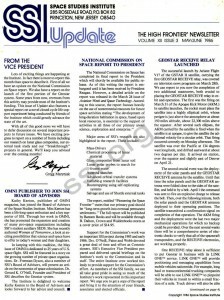 First of all we have an update on the National Commission on Space report. We also have a report on the launch of the first portion of the Geostar system. Some years from now, revenues from this activity may provide most of the Institute’s funding. This issue of Update also features a special report on a novel closed-cycle life support experiment being conducted by friends of the Institute which could greatly advance the state of the art. Kathy Keeton, publisher of OMNI magazine, has joined the Board of Advisors of the Space Studies Institute. Miss Keeton has been a life-long space enthusiast and a key supporter of SSL Through her work in OMNI, she has promoted the expansion and creation of many pro-space organizations including SSI’s student auxiliary SEDS. She has recently authored Woman of Tomorrow, a look at exciting possibilities that science and space have to offer to today’s women and their daughters. 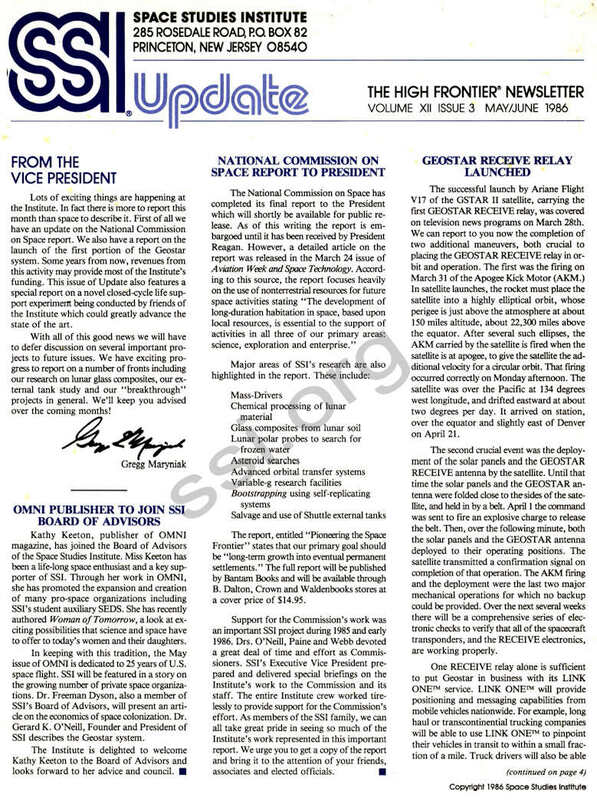 In keeping with this tradition, the May issue of OMNI is dedicated to 25 years of U.S. space flight. SSI will be featured in a story on the growing number of private space organizations. Dr. Freeman Dyson, also a member of SSI’s Board of Advisors, will present an article on the economics of space colonization. Dr. Gerard K. O’Neill, Founder and President of SSI describes the Geostar system. The Institute is delighted to welcome Kathy Keeton to the Board of Advisors and looks forward to her advice and council. Major areas of SSI’s research are also highlighted in the report. The report, entitled “Pioneering the Space Frontier” states that our primary goal should be “long-term growth into eventual permanent settlements.” The full report will be published by Bantam Books and will be available through B. Dalton, Crown and Waldenbooks stores at a cover price of $14.95. 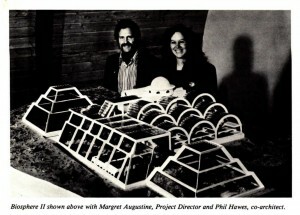 Support for the Commission’s work was an important SSI project during 1985 and early 1986. Drs. O’Neill, Paine and Webb devoted a great deal of time and effort as Commissioners. SSI’s Executive Vice President prepared and delivered special briefings on the Institute’s work to the Commission and its staff. The entire Institute crew worked tirelessly to provide support for the Commission’s effort. As members of the SSI family, we can all take great pride in seeing so much of the Institute’s work represented in this important report. We urge you to get a copy of the report and bring it to the attention of your friends, associates and elected officials. The successful launch by Ariane Flight V17 of the GSTAR II satellite, carrying the first GEOSTAR RECEIVE relay, was covered on television news programs on March 28th. We can report to you now the completion of two additional maneuvers, both crucial to placing the GEOSTAR RECEIVE relay in orbit and operation. The first was the firing on March 31 of the Apogee Kick Motor (AKM.) In satellite launches, the rocket must place the satellite into a highly elliptical orbit, whose perigee is just above the atmosphere at about 150 miles altitude, about 22,300 miles above the equator. After several such ellipses, the AKM carried by the satellite is fired when the satellite is at apogee, to give the satellite the additional velocity for a circular orbit. That firing occurred correctly on Monday afternoon. The satellite was over the Pacific at 134 degrees west longitude, and drifted eastward at about two degrees per day. It arrived on station, over the equator and slightly east of Denver on April 21. The second crucial event was the deployment of the solar panels and the GEOSTAR RECEIVE antenna by the satellite. Until that time the solar panels and the GEOSTAR antenna were folded close to the sides of the satellite, and held in by a belt. April 1 the command was sent to fire an explosive charge to release the belt. Then, over the following minute, both the solar panels and the GEOSTAR antenna deployed to their operating positions. The satellite transmitted a confirmation signal on completion of that operation. The AKM firing and the deployment were the last two major mechanical operations for which no backup could be provided. Over the next several weeks there will be a comprehensive series of electronic checks to verify that all of the spacecraft transponders, and the RECEIVE electronics, are working properly. One RECEIVE relay alone is sufficient to put Geostar in business with its LINK ONE™ service. LINK ONE™ will provide positioning and messaging capabilities from mobile vehicles nationwide. For example, long haul or transcontinential trucking companies will be able to use LINK ONE™ to pinpoint their vehicles in transit to within a small fraction of a mile. Truck drivers will also be able to use the satellite link to get short, digital messages back to their fleet dispatch headquarters. Neither one of these capabilities is available from any other company. There are now about 12,000 advance orders for that service, and the manufacturers are assembling LINK ONE™ user terminals to fill those orders. The first prototype units, to be delivered this month, are being made by Comsat Technology Products. The production units, made by M/A-COM and by SONY, are due to start coming off the assembly lines in the third quarter of this year. GEOSTAR will be using this program as a first step in its overall business plan to provide extremely precise positioning and two-way digital communications to people on the move all around the world. On June 1, 1989, researchers will seal the airlock on a two acre enclosed total ecological system in the foothills of the Catalina Mountains north of Tucson – and Biosphere II will have come into being. The project succeeding, this event could be repeated to create closed biospheric systems for ecological studies, refuges for endangered species, and life habitats on space stations or other planets. Space Biospheres Ventures, in conjunction with the Institute of Ecotechnics, has undertaken a major research and development project in the study of biospheres with the objective of creating and producing biospheres, the Biosphere II Project. All life known to humankind exists within the context of a biosphere, the biosphere of planet Earth: a stable, complex, evolving system containing life, composed of various ecosystems operating in a synergetic equilibrium, essentially closed to material input or output, and open to energy and informational exchanges. Space Biospheres Ventures and the Institute of Ecotechnics intend to create a second biosphere, Biosphere II, essentially isolated from the existing biosphere by a closed structure, composed of components from the existing biosphere. Like the biosphere of planet Earth, Biosphere II will be a stable, complex, evolving, essentially materially closed, life closed, energetically and informationally open system containing five kingdoms of life, at least five ecosystems, plus humankind, culture and technics. A joint venture between a U.S. venture capital management firm and a U.S. venture capital investment firm, Space Biosphere Ventures has organized the project as a private, for-profit endeavor funded by a venture capital commitment over a seven year period. The Institute of Ecotechnics, a London based International ecological development firm, has been engaged to conduct and manage the research and development phase of the project. Certain aspects of the project will be contracted out to independent institutes and firms, including Sarbid, Ltd., a London based architectural firm, for overall design management; and Oasis Systems International, which is affiliated with the Environmental Research Laboratory of the University of Arizona, for scientific engineering. Contracted consultants for species selection, operation, maintenance design and monitoring of specific biomes within Biosphere II include the New York Botanical Garden Institute of Economic Botany (rain­forest ecosystem), the Marine Systems Laboratory of the Smithsonian Institution (marine and marsh ecosystems), Tony Burgess and Dr. Peter Warshall (desert and tropical savannah ecosystems), and Oasis Systems International/Environmental Research Laboratory (intensive agriculture ecosystem). The Project Review Committee ­ established by SBV to oversee the project, review progress and provide consultancy inputs – is composed of directors of Decisions Team Limited (the managing partner of SBV) and several consulting members who are prominent figures in the scientific and space community. The timetable of the project calls for the design and engineering of Biosphere II through 1986, with construction commencing in January 1987, partial closure experiments from mid-1988, and the two year full closure phase commencing June l , 1989. Space Biospheres Ventures then looks to have the capacity to begin to market and produce biospheric systems by 1992. Potential clients would include space programs, universities, research institutes, and governments. Certain developments and discoveries will be held as proprietary, while others will be put into the public domain. The first phase of project construction – a plant tissue culture laboratory and a 17,000 square foot plant and aquaculture greenhouse and support buildings complex – is now complete and these facilities in full operation. In addition to commercial production, the greenhouse and tissue culture laboratory serve as research facilities for testing and propagation of candidate species for Biosphere II, a quarantine and receiving area for actual Biosphere II plant specimens, training for the potential managers of Biosphere II, and research in integrated pest management (biological pest control). Space Biospheres Ventures is located at and operates the SunSpace Ranch Conference Center, a 2,500 acre facility near Tucson, Arizona. As well as serving as a research institute and site for the Biosphere II project, SunSpace Ranch operates as a commercial professional conference center hosting a wide variety of corporate, scientific and academic conferences. Let’s take a tour of Biosphere II, as presently conceived. To get a sense of scale,the structure covers approximately two acres, is 98,000 square feet in floor area, and 5 million cubic feet in volume. Starting with the four story white domed building, the human habitat area: this will include apartments for the eight Biospherians (resident managers); laboratories; computer, communications and office facilities; workshops; libraries and similar facilities. The adjoining building is the amphitheater, a multifunction space for public presentations and perhaps recreation activities. The series of arched structures immediately to the south of the habitat is the intensive agriculture biome. Crops for food, fiber and other human uses will be grown on the broad terraces; domestic animal areas are along the sides of these terraces. This biome will be 20,000 square feet, approximately the same size as the present greenhouse. Next, we go to the natural biomes. The tallest space frame structure, the rainforest biome, is approximately 80 feet high and 20,000 square feet in floor area. From the mountain in the center of the rainforest flows a stream, down a waterfall, across the forest floor and into the next section, the transition biome. The stream then flows along a tropical savannah plain (at the top of the rock cliffs), and down to a fresh water marsh at the far end of the transition biome, then the salt water marsh and into the ocean. The ocean is 35 feet at its deepest point and includes a coral reef ecology at the northern end. Wave action, required for the coral reef ecosystem, is generated mechanically. A thorn scrub forest completes the savannah biome and marks the ecotone between the transition biome and the desert biome, the farthest south of the space frame units. An approximately one million cubic foot lung (not shown) is also attached: a structure able to expand and contract with shifts in atmospheric volume/pressure. Biosphere II is designed so that the human habitat/intensive agriculture biome and the natural biomes can be sealed off from each other and operate as independent systems, for experimental purposes or in the event of a malfunction in either. Ordinarily, there would be air flow among all biome units. Air circulation will be accomplished by convection as much as possible, with differences in altitude, temperature and in some cases structural diversions of air flow built into the design. Some mechanically-driven circulation will be required, however, and an air tunnel is designed beneath the transition biome for this purpose. Water circulation will also be partially mechanical and partially natural processes; water evaporation from the ocean will be driven by air currents back to the rainforest where a cooling coil at the summit of the unit will condense water back into the stream and the rainforest. A system of computer operated louvers will permit differential shading throughout Bio­sphere II, for temperature and light control. Species selection is underway, with the various biome teams researching the requirements, adaptibility, and uses of various plant and animal species. Besides domestic animals, Biosphere II will be habitat to various birds, reptiles, insects, and small mammals. Plant tissue culture will play a major role in Biosphere II for several reasons. First, tissue culture allows the propagation of plantlets which are free of viral and fungal infestations which may be in some cases undesirable to introduce into the Biosphere II system. Second, in the event of a major plague, tissue culture can replenish the plant population many times more rapidly than traditional seed methods. Thirdly, since tissue culture requires only a microscopic amount of plant material, relatively large gene pools of plants can be stored in a small area. In Biosphere I, ecosystems ordinarily maintain a genetic reservoir in the large number of individuals in any given population. The number of individuals of any species in an ecosystem will be limited in growing area in Biosphere II, but a tissue culture gene pool can be immense in variety. Due to factors such as outgassing, permeability to gas exchanges, and longevity, construction materials and techniques are being carefully evaluated during the design and engineering phase. A test module, approximately 27 feet by 27 feet, is under construction to test the efficacy of the glazing materials and techniques. This module may be used later in 1986 for limited closed system experiments with small ecosystems. The Florida Local Support Team recently presented the Second Annual Awards for Academic Excellence to three students in the space science and technology programs at Florida Institute of Technology. Receiving the Awards were Horst Fuhrmann, graduate space technology, Rick Vargo, graduate space science, and David Kornbluh, undergraduate space science. This year the awards were presented by Dr. Jerome Keuper, founder and retiring President of FIT. 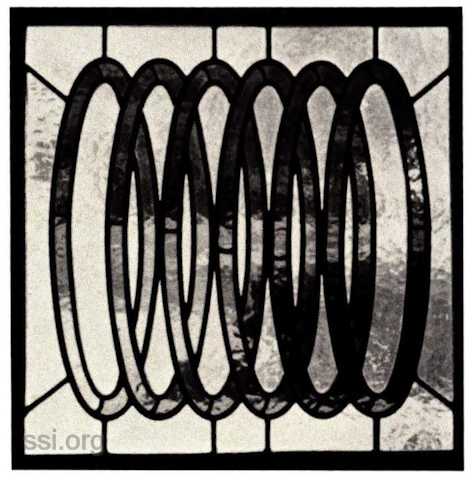 Bob Brodbeck and the Ohio Local Support Team will be manning an SSI exhibit at Hamvention. Hamvention is a convention of ham radio operators. We will include details of the April 27 gathering in the next newsletter. Gregg Maryniak will be conducting a course on future spaceflight at the Intrepid Sea Air Space Museum. The six-week course is scheduled for Tuesday evenings, commencing May 20. For more information, please call the SSI office. SSI supporter Dr. T. D. Lin of Construction Technology Laboratories has been given a 40 gram sample of lunar soil by NASA for his research into lunar concrete. Dr. Lin, a resident of Illinois is a member of the Chicago Society for Space Studies, SSI’s original local support team. He has presented his research at CSSS and at our 1985 SSI Princeton Conference. The Institute congratulates Dr. Lin and his company on their selection by NASA. Dr. Gerard O’Neill kicked off SSI’s new Replicator Project by presenting the first Replicator insignia to Morris Hornik. Morris, who has signed up over 90 SSI Senior Associates, was given the award at a reception following the successful launch of the first Geostar satellite receive relay. A special thank you to Peter Diamandis who signed up 8 new Senior Associates. The first list of Replicators has also been announced. These are SSI subscribers who have signed up either one new Senior Associate or Corporate Member or five new subscribers. Congratulations and thanks to each new SSI Replicator! SSI welcomes its newest corporate member Borland International Inc. Borland is well known in the personal computer industry as a producer of high-quality software at reasonable prices. Borland has generously donated copies of its Sidekick and SuperKey software for use at the Institute. We are enjoying noticeable productivity increases as the result of their support. Last week the Princeton office received a mysterious package from the midwest. It proved to be a beautiful stained glass panel depicting the mass-driver symbol. This work of art was created by Senior Associate Mark Senn who has assisted SSI’s mass-driver effort by donating computer programming. Mark has shown that he is a craftsman in glass as well as code. We are pleased to have this opportunity to thank him publicly for his many donations of time and effort!